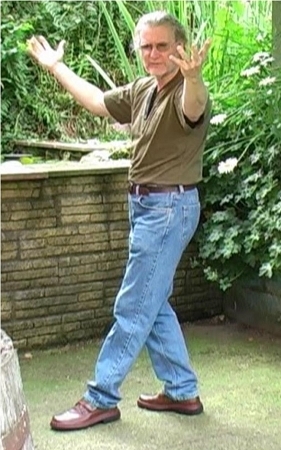 Each of the major postures from Bagua have a hidden meaning, either for the healing benefits or for gaining of power for the fa-jing and fighting system. And the hidden meanings are hidden in the very names of each posture. This information was only ever given out to very advanced students after they became proficient in the fighting side of the art as when one was proficient in self defence, one could then understand about the healing and Qigong side. Goes from the end of V. 2 up to the end of Palm Change 6. (Palm Changes 5, 6). Also on this volume are the last three of the 8 Palm training drills, 6, 7, 8. By knowing the names of each posture, we are able to find the hidden way to perform each posture as well as to find the hidden healing meaning or Qigong to gain power etc. For instance, the posture called 'Leaning On the Horse & Ask The Way' works upon the energy system of the body which is stored in the backbone.